Platt.—Algernon John Frederick Platt, Trent View, Newark; only son of Frederick Platt, D.L., J.P., Barnby Manor; born at Carr House, Doncaster, June 11th, 1876; educated at Eton, 1889-91. 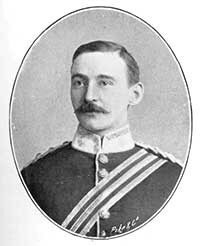 Late Captain of the 4th Battalion Sherwood Foresters, Derbyshire Regiment; hunts with the Blankney, Belvoir (Duke of Rutland's), and Lord Harrington's hounds. Married Norah, eldest daughter of Charles J. Cunningham, D.L., J.P., Kelso, Roxburghshire, and has issue Margaret Florence, born March 8th, 1901. Clubs: Bath Club, London, and Notts County. ‘Information was received in Newark on Monday on the death at Lochmaddy, North Uist, Scotland, of Mr Algernon John Frederick Platt of Barnby Manor, near Newark. Deceased, who was only 36 years of age had been in bad health for a long time and at Barnby had been attended by Dr Dunwoody. Some 2 months ago he went to Scotland, hoping that the change would do him good. He there had a reoccurrence of his illness, and again the services of a medical man were required, but the patients condition grew worse, and 2 specialists were hurriedly summoned to his bedside; but their efforts were unavailing, and on Sunday night Mr Platt passed, death due to congestion of the lungs. 10 days ago Mrs Platt, who was visiting at her home, Muirhouselaw, NB was telegraphed for and hastened to her husbands side. She was with him at the end. Much sympathy will be extended to Mrs Platt and the young family in their bereavement. Deceased was the son of the late Mr Frederick Platt, formally a High Sheriff for Notts, who in 1880, purchased the estate of Barnby Manor , remodelled and rebuilt the manor house. It is a remarkable coincidence that the son died on the sixth anniversary of his fathers death. Deceased leaves a widow and three children. In May 1900 he married Norah, eldest daughter of Mr C J Cunningham of Muirhouselaw, St Boswells, NB, and the heir to the estate is the youngest child, Charles John Frederick Platt who is 5 years of age.